A three + week 14 city/21 performance tour Starring Two-Time and reigning Olympic Gold Medallist and Five time World Champion Ms. Oksana ‘Pasha’ Grishuk, with ten champion ship quality ensemble skaters. Pasha will perform both main roles, Clara in Nutcracker and as Cinderella. Begins: Louisiana, November 30th. Ends in Texas, December 23rd 2001. Starring Two-Time and reigning Olympic Gold Medallist and Five Time World Champion in Ice-dancing Ms. Oksana ‘Pasha’ Grishuk. Other star-figure skaters invited: Olympians –Lu Chen, Alexei Yagudin and Roca & Sur. Very special guests include a pairs team and solo skater from the Special Olympics Figure Skating Association. The show is part of the opening of the annual City of Beverly Hills Xmas season.There will also be a street parade in conjunction with the ice show and tree lighting. Mayor, The Honorable Mark Egerman will be in attendance. Ms. Oksana ‘Pasha’ Grishuk will open and close the show, skating two new numbers. Pasha signs with Meridian Models in LA! Beverly Hills, CA - November, 2001 - Meridian Models is the print division of Dorothy Day Otis Partners and has been in existence for nearly a decade. Dorothy Day Otis Partners commercial department houses some of the most recognizable faces on television today. Pasha is the only lady in all of ice dance history to have won two, back to back Olympic Gold medals in ice dancing. She has five world titles and has amassed an incredible array of 26 gold medals in competition. Pasha has already appeared in commercials for Pepsi, NBC TV's Olympic coverage, and guested on Fox TV's Beverly Hills 90210, USA TV's Happy Hour and the Black Scorpion TV series. At a star studded press reception in the five star St. Regis hotel wednesday, noon-1:00pm Pacific Coast Time for the upcoming title fight at the Olympic Auditorium in Los Angeles, December 9th between California based Oscar de La Hoya and his opponent from Russia, Roman Karmazin, the two-time (and reigning) Olympic Champion Gold Medalist and five time World Champion figure skater Ms. Oksana "Pasha" Grishuk was introduced to the attendees and the contenders by famed Beverly Hills attorney Robert Shapiro. Approximately two hundred print and tv press were in attendance and Pasha’s language skills came in very handy as Roman speaks no English. October 2001 . Pasha is accompanied by her Agent to a very prestigious '$1,000 US Dollar a person' charity event in Beverly Hills. "Fitness programs have been a big and important part of my life - said Pasha - The Sports Club LA' provides all the facilities and services I or anyone will ever need, for beginners to Olympic Champions. I believe this is the best workout place in the world! " "The Sports Club/LA is a 100,000square foot luxury sports and fitness complex designed to fulfill your every fitness need. Recognized as the finest sports and fitness complex in the world, The Sports Club/LA features over 40 different sports and fitness options under one roof, offering the most popular and progressive facilities, services and programming combined with personalized service in an atmosphere of unprecedented comfort and convenience. A total fitness environment like nothing that has ever come before." The club has a star-studded roster of celebrities who use the facility for their health and fitness needs. Pasha wore a truly beautiful silver ball gown and mask. As a member of the Board of Governors, Pasha was on a par with other 'board' members such as the producer Ron Howard, world reknowned chef Wolfgang Puck and actors Dyan Cannon and Robert Davi. The Venetian Ball was held in Beverly Hills, Saturday September 8th , and benefits the Starlight Childrens Foundation. Through wish-granting and many other innovative programs the lives of over 5,000 children and their families are affected each month. The ‘Ball’ was sponsored by (among others) Ferrari and Versace. August 2001 - Pasha in Europe! Pasha recently returned from a month long trip to both Germany and Spain.While in Espana Pasha choreographed a complete TV video for one of Spains leading bands. Pasha is the guest of HRH Prince Albert , staying at the Grimaldi Palace for three weeks, and for the Monaco Grand Prix in Monte Carlo. Second year running. Pasha makes a commercial for NBC TV in Los Angeles. A promotion for 2002 Olympics in Salt Lake City. She appears on ice and plays TWO parts. Skater and coach!. Lightforce Media Inc, TPM Productions and two time Olympic Champion Pasha Grishuk on the fast track. Lightforce Media Works, a division of Lightforce Internet Media Inc, www.lfimedia.com executives and co-production heads Jay Malla and Robert Pfitzner announced today they have entered into a joint venture with Jay Ward , President and CEO, TPM Management and Productions, and reigning two-time Olympic Champion and five time World Champion figure Skater Ms. Pasha Oksana Grishuk to produce and distribute a lifestyle magazine series for the Internet. "We are extremely excited to be associated with a very accomplished sports personality such as Ms. Pasha Grishuk. She is a multi-talented dynamo who has proven time and time again her unique ability to perform and captivate audiences. The show hosted by Ms. Grishuk will feature interviews with celebrities from the world of entertainment, pop culture, fashion and sports. Our plans call for us to produce a pilot that will be cut into four episodes that will be web cast on www.lfitv.com and made available to our affiliate partners for Internet syndication. There will be ample opportunity both for advertisers and corporate sponsors", says Lightforce Internet Media's Jay Malla.
" I am very happy to be utilizing my knowledge in sports, art and acting. I plan to skate, dance, interview, mingle, and entertain and netizens with amazing guests and situations. It's going to be a hip, fresh and cool show that appeals to pop culture enthusiasts. You know 'Girls also wanna have fun' - and we will! This is going to be great", said Pasha. "It's exciting to be associated with a superb company such as Lightforce. The 'Pasha Show' has the potential to grow very fast by means of syndication and I am confident that Ms. Pasha Grishuk will bring the hard work ethic and determination that enabled her to amass a record breaking 26 gold medals in her amateur skating career; including Two unprecedented back to back Olympic Gold Medals in ice dancing to our project", said TPM's Jay Ward. The show as yet untitled is scheduled to begin production early next month with its worldwide premiere schedule for March 21st on www.lfitv.com. Pasha is honored by famous artist! Feb 4th. 2001 Laguna Beach, CA. Grand opening of World famous artist, Christian Riese Lassen's latest gallery, benefiting the Millers Children's Hospital and Friends of the Sea Lions.
" 8:00pm. Special presentation to Ms. Pasha Grishuk, two-times Olympic Gold Medal figure skating Champion"
Pasha will be presented with an original, signed 'scape' by the artist honoring her work with children's charities. 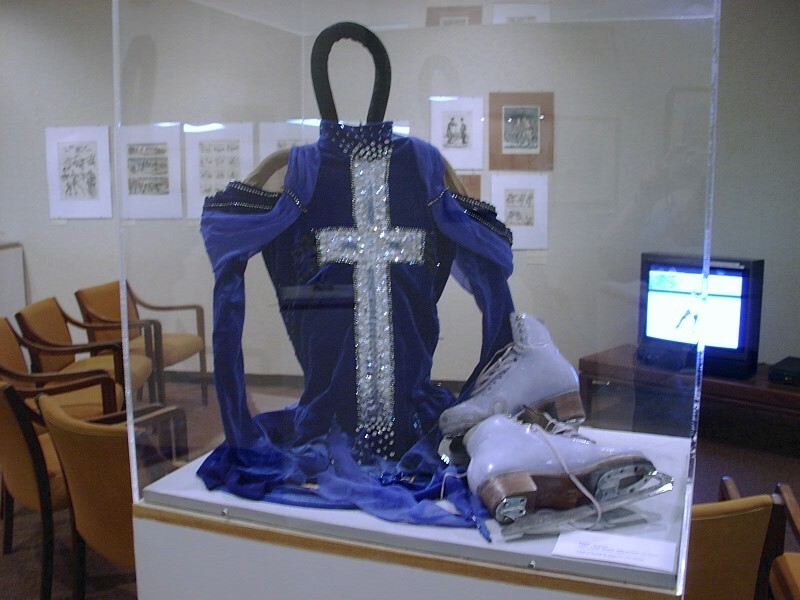 Two Times Olympic Champion Pasha Grishuk famous lilac boots together with her Memorial Requiem outfit from Olympic Games in Nagano and continuous-loop video of that Olympic winning routine, can be seen in person in Colorado Springs or on line!!! until about June 2001!